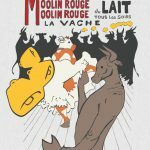 Welcome to the Moolin Rouge, where cows can can all night long! 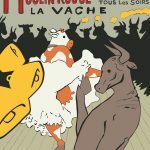 A loving spoof of Henri De Toulouse-Lautrec’s famous poster. Vote for it now at threadless, so that you can wear it!